If your iPhone is displaying a No SIM Card Installed error, you can't connect to cellular phone networks, you can't make and receive calls or use 4G LTE wireless data. Besides your iPhone alerting you with an error message, you'll know your iPhone is having a problem with its SIM card if the carrier name and signal bars/dots at the top of the screen are missing, or have been replaced by No SIM or Searching. There could be a number of reasons for the No SIM error. It could be that the iPhone doesn't recognize its SIM card, which is used to connect to these networks. This problem can also be caused by your SIM card becoming slightly dislodged. Whatever the cause, the solution is pretty easy: All you need to fix this is a paper clip. Here's what to do if your iPhone says "No SIM." No SIM Card Installed isn't the only version of this error. 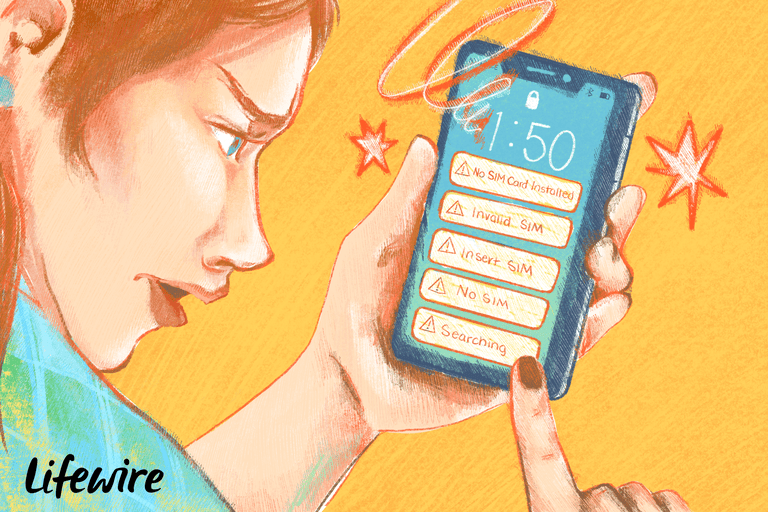 If your iPhone is displaying warnings like Invalid SIM or Insert SIM, you've got the same type of problem and the tips in this article can help. To fix SIM card issues, you have to know where to find the card (and if you want to learn a lot more about what the SIM card is and what it does, check out What is an iPhone SIM Card?). The location depends on your iPhone model. iPhone, iPhone 3G, and iPhone 3GS: Look between the sleep/wake button and the headphone jack at the top of the phone for a slot with a tiny hole in it. This is the tray that holds the SIM card. iPhone 4 and newer: On the iPhone 4 and newer, the SIM tray is on the right side of the phone, near the sleep/wake (or Side) button. The iPhone 4 and 4S use a microSIM. Later models have the slightly smaller, more-modern nanoSIM. If your iPhone is displaying the No SIM error, or you don't have any cellular bars when you should, try these steps, in this order, to fix the problem. Since the No SIM problem is often caused by the SIM getting slightly dislodged, the first fix is to try to put it back in place. To re-seat the SIM card in its slot, get a paper clip (or use Apple's "SIM card removal tool," included with some iPhones), unfold it, and push one end into the hole in the SIM card tray. This will pop the tray out of its slot. Push it back in and make sure it's firmly seated. After a few seconds (wait up to a minute), the No SIM Card Installed error should disappear and your regular bars and carrier name should re-appear at the top of the iPhone's screen. If it doesn't, fully remove the SIM. Make sure the card and the slot aren't dirty. If they are, clean them. Blowing into the slot is probably OK, but a shot of compressed air is always best. Then, reinsert the SIM. Swipe up from the bottom of the screen (or down from the top right on iPhone X and newer) to reveal Control Center. Tap the airplane icon so that it's highlighted. This enables Airplane Mode. Wait a couple of seconds and then tap it again, so that the icon is not highlighted. Swipe Control Center down (or up) to hide it. Wait a few seconds to see if the error is fixed. If a new version is available, follow the onscreen instructions to install it. Press the sleep/wake button (on the top right of early models, on the right side of more recent models). Keep pressing until a slider appears on the screen that turns off the iPhone. Let go of the button and swipe the slider left to right. Wait for the iPhone to turn off (it's off when the screen goes fully dark). Press the hold/Side button again until the Apple logo appears. Let go of the button and wait for the iPhone to restart. If you're using an iPhone 7, 8, X, XS, or XR the steps are different. In that case, check out this article for full instructions on restarting those models. If an update is available, a window will pop up. Tap it and follow the onscreen instructions. If your iPhone still says it has no SIM, your SIM card could have a hardware problem. One way to test this is by inserting a SIM card from another cell phone that you know works fine. Make sure to use the correct size – standard, microSIM, or nanoSIM – for your phone. If the No SIM Card Installed warning disappears after inserting another SIM, then your iPhone SIM is broken. You can get a new one from Apple or your phone company. It's also possible that your phone company account isn't valid. In order for your phone to be able to connect to a phone company network, you need a valid, active account with a phone company. If your account has been suspended, canceled, or has some other problem, you may see the SIM error. If all of these steps don't solve the problem, you have a problem that you can't fix. It's time to call tech support or to take a trip to your closest Apple Store. Get step-by-step instructions on how to do this in How to Make an Apple Store Appointment.